Photo courtesy of Hearth Song. I know so many Boat kids who would love this! The best part of having kids during the holidays is seeing their eyes light up when they receive that perfect gift. The giving of gifts is fun, the procuring of said gifts- not so much. If you are like me and abhor actually leaving your home or boat to battle crowds of impatient people throwing money away on the latest plastic piece of junk which will require batteries, emit obnoxious sound effects and be forgotten in 2 weeks time this post is for you. My favorite toy store is online and open for business. 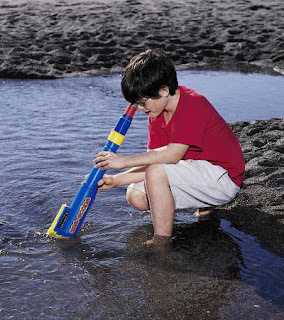 Not only do you not have to trudge to a brick and mortar store, the items this particular retailer sells are quality toys which have lasting play value and are durable enough to survive life in a marine environment. I've been a fan of theirs for about 15 years or so. Really great quality toys and crafting kits, excellent customer service and reasonable shipping. That's my Christmas shopping done and I did not even have to deal with one single, surly shopper. I used to shop Hearthsong for my kids for years! and I know a lot of boat grownups who would like that little water viewer. Hmmm. I must now visit their website.